When I started thinking about gift ideas for my step-dad, for some reason gyrocopter jumped into my head and wouldn't let go. 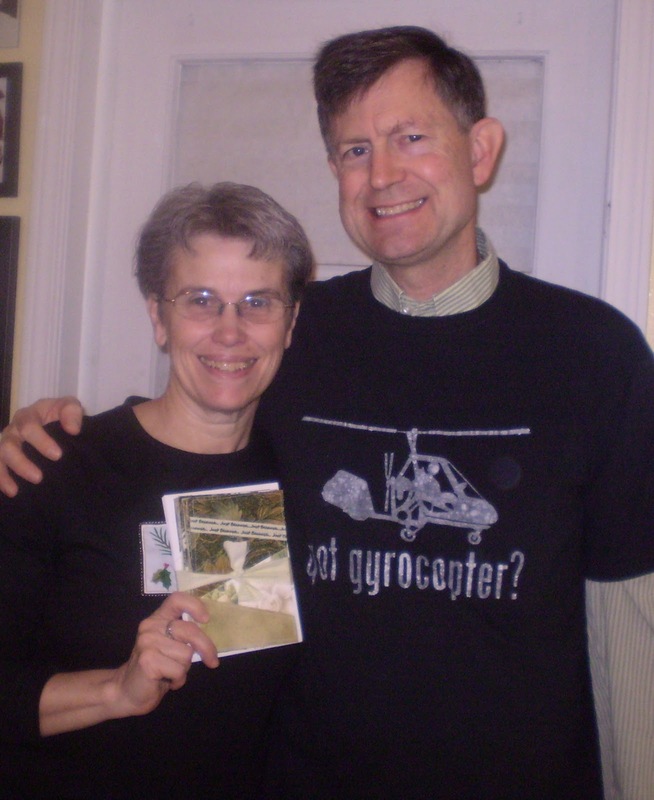 I googled gyrocopter gift ideas and came up with a T-shirt similar to this. I'll be honest. I just copied their concept outright. I didn't want to pay the 25 or 30 dollars for the shirt, and I've been wanting to try out freezer paper stencilling for a while. I don't feel too bad though, since they're just copying the "got milk?" campaign, and I came up with my own gyrocopter graphic. Sort of. 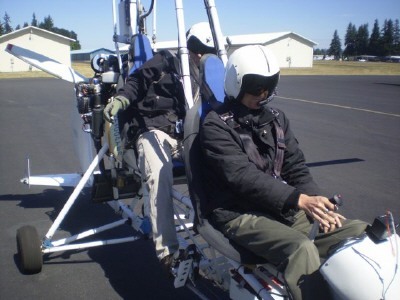 I found a gyrocopter photo online from the website of the company where Mark took his flight, Sport Copter, Inc. Then after a bunch of editing, I came up with a black and white sillouhette. The image wasn't perfect, but it was good enough for me to print out onto freezer paper and then make the lines smoother as I traced the edges with a razor blade. Then another google search turned up that the "got milk?" font is called Phenix American and you can download it for free here. I ironed the freezer paper onto the T-shirt shiny side down, and made sure all the edges were good and sealed. Then I applied the glue, nice and thick, by DABBING not brushing it onto the fabric. Here's where the story gets a little sad, though. I didn't really follow a tutorial for freezer paper stencilling, even though many exist. I knew from personal experience that acrylic paint is PERMANENT the second it touches T-shirts...so I used regular acrylic paint instead of fabric paint. (I'd heard the only difference in the two is there's a little fabric softener in fabric paint.) Well, I don't know if I put it on too thick...or it was the wrong kind of paint...but I'm blaming the paint. After washing the T-shirt once, it looked terrible. I washed it about 5 times and most of the paint had flaked off, so I picked the rest of the paint off myself. The end result looks like this. Now really...this doens't look sooooooo... bad. It actually looks like a finish that's popular in the teenage set...except that their distressed finishes usually look more evenly distressed than this. Mark says he's happy with it the way it is...but I'll still make him a new one as soon as I get my hands on real fabric paint. I think yours is great, btw! Definitely looks distressed.